Description: In Indiana, young Abe Lincoln and friend Henry Brooner hunt squirrel and other small game with their jointly owned squirrel rifle for which they paid $15.00 when they purchased it in Vincennes, Indiana in the 1820's. 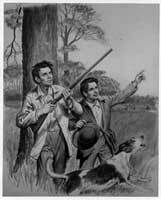 Art depicts Lincoln with the rifle, in the company of a his friend and a dog. Lincoln's friend is pointing toward a target.